The world has made incredible progress in the fight against HIV/AIDS—adding millions more people to life-saving treatment, gradually reducing the rate of new HIV infections, contributing more financial resources, and developing better tools to fight the disease along the way. But for more than three decades, the deadly disease has been outpacing us, with more people becoming newly infected with HIV than we were able to add to treatment each year. 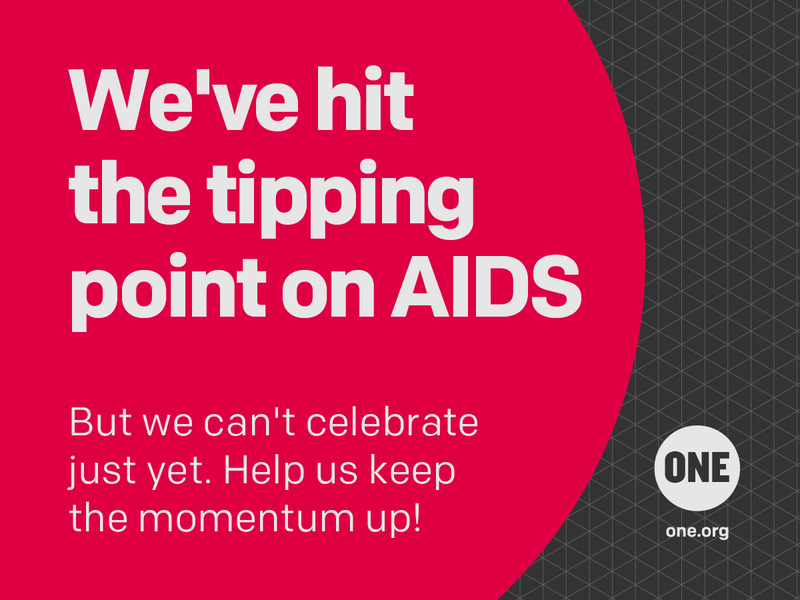 ONE’s brand new AIDS report “At the Tipping Point: Tracking Global Resources on AIDS, Volume 3” finds that, for the first time in the history of the disease, we’ve reached a major milestone: the beginning of the end of AIDS. It means that we added more people to AIDS treatment in 2013 than the number of people who became newly infected with HIV – and that’s a really big deal. It means we’re finally getting ahead of this disease. Despite this good news, we should not run a victory lap just yet. Our report examines in detail three major challenges ahead: insufficient resources (we’re at least $3 billion short annually), increased risk for marginalised groups (including the LGBT population, drug users, and adolescent girls), and the fragility of progress as a whole. We have reached the tipping point at the global level, but not all countries are there yet—only 15 sub-Saharan African countries have reached the tipping point, for instance—and the gains made can easily stall or unravel. Complicating matters further, many countries’ health systems are incredibly weak, which means that when crises like Ebola hit, much of the progress we’ve made across the health and development sectors is jeopardised. Target HIV where it is, not where it is easiest to reach. This includes developing tailored strategies to reach marginalised populations more effectively. Deploy bold new funding from a more diversified base. We cannot accelerate progress with flat funding or even incremental increases from the same handful of donors. More countries—including African governments themselves—need to step up their contributions to HIV/AIDS and health. Build resilient health systems that can tackle AIDS alongside other health challenges. We must ensure that next time a crisis like Ebola emerges, countries are prepared to weather the storm. Read the full report and get graphics to help share our findings.